Olive Riley, a feisty 107-year-old Australian great-great-grandmother with amazingly clear memories of her colorful life, has just become the world's oldest blogger. She is 12 years older than Spain's Maria Amelia, the previous titleholder. Physically frail but mentally alert, Olive lives in an aged care hostel 50 miles (80 km) north of Sydney. She was born in Broken Hill, a tough mining town in Australia's arid Red Centre 565 miles northwest of Sydney, in 1899. Sydney was then the capital of the British colony of New South Wales, ruled from London by an aged Queen Victoria. Australia did not exist as a nation until January 1, 1901, when the separate colonies united to form a Federation. 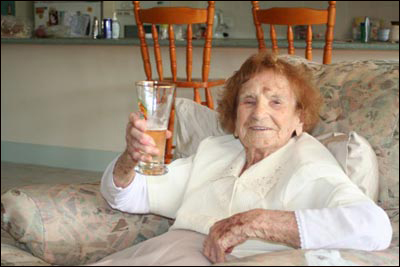 Olive says she was twice married, raised her three children on her own, survived two world wars and the Great Depression of the 1930s, and has worked as a barmaid and accountant. "Good morning everyone. My name is Olive Riley. I live in Australia near Sydney. I was born in Broken Hill on Oct. 20th 1899. Broken Hill is a mining town, far away in the center of Australia. My friend, Mike, has arranged this blog for me. He is doing the typing and I am telling the stories. He thinks it's a good idea to tell what's going on. He already made a film about me a few years back and people liked that, so they might like this blog too, he says. We'll see. I'm starting with my Christmas trip. Last Christmas I flew up to Brisbane to stay with my great-grandson, Darren, Ginelle and their two kids. Darren works for Qantas and so he was able to arrange for me to be hoisted up into the plane in a lift. 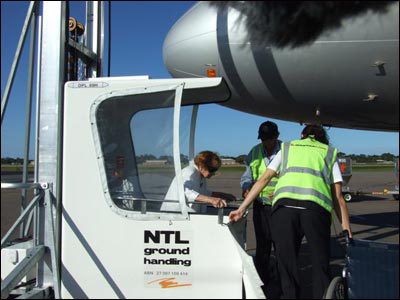 They don't have one of those walk-on ramps at Newcastle airport where we flew from. This is actually me coming back, out of the plane, but it looks the same. Mike is fascinated that I went for a swim in the pool at Darren's house. Here's me being held up by my great-grandson It was lovely! Mike asked me a hundred questions about it when I came back. MIKE: But how did they get you into the water, Ollie, since you don't walk that well? 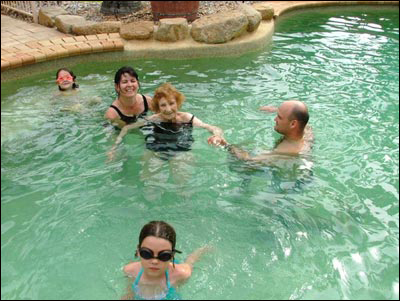 Olive swimming with her great-great-grandchildren. OLIVE: They helped me down into the water, one on each side, and I just floated around flapping me arms and drinking me shandy. (Shandy is half beer, half lemonade). MIKE: They gave you a beer in the water? OLIVE: Too right! A shandy. I had one every day I was up there too. OLIVE: There I was, good as gold with my great-great-grand kids paddlin' around me all excited. 'Nana's swimmin'! Nana's swimmin'!'" A grove of olive trees has been planted at Broken Hill. Their first crop is expected to be ready in 2010. Judging by Olive Riley's amazing zest for life, it seems likely that she will return to her birthplace to pick some of those first fruit. LONG LIVE OLIVE RILEY!